I thought I’d start with this image from your 4th birthday party – May 19, 2012 – because for me, it sums up both who you are at this time in your life, and what your party day was like. Since you were a baby, you’ve often been branded (by your Grandpa Grekin and others) as a “spitfire” and a “spark plug” – and, in somewhat less appealing moments, a “handful.” You are your father’s daughter in that you are fiercely passionate, you have strong opinions (God help us when you’re a teenager), and you show no signs of shyness or inhibition. (Your father reports that on a recent evening, when I had to work, you were in a restaurant and pursued conversations with patrons at two different tables.) So for me, this photo seems to, at the very least, hint at all of these things. 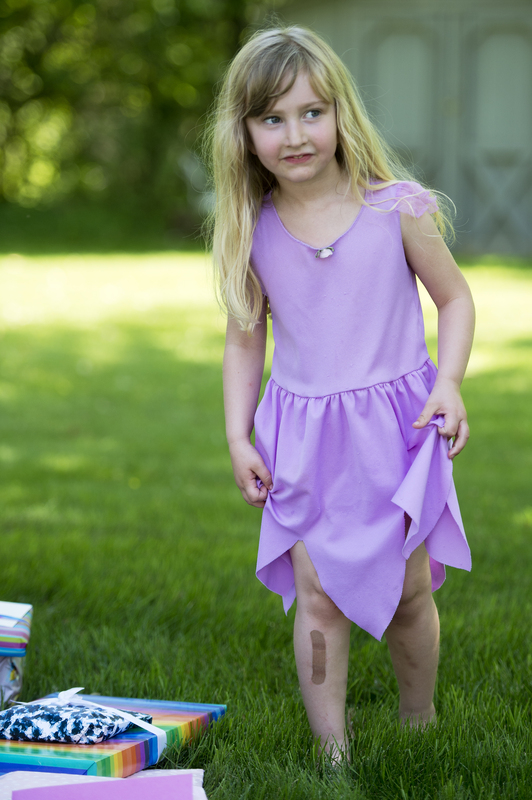 Appropriately, you’re wearing a purple fairy dress (complete with limp mesh wings in the back) that we got from your Aunt Susan at Christmastime, when the airline lost your little suitcase. 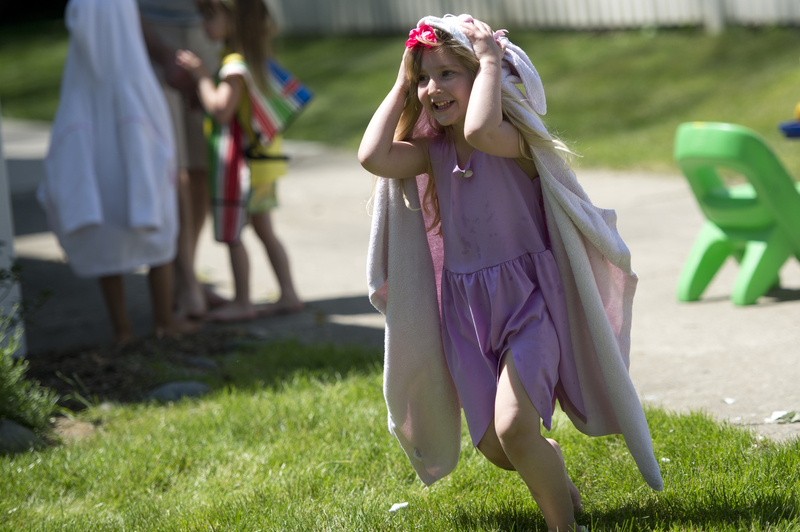 You’ve stuck a bright pink flower hair clip that’s supposed to be part of a headband into the dead center of your hairline; and you’re wearing a bunny towel as a bizarre kind of cape while running barefoot in the sunshine across our backyard, beaming as you go. You are in your element. And more broadly, the party had just this kind of vibe. Between the trampoline we just inherited from neighbors who moved, and the kiddie pool, and the easel and sidewalk chalk, and the inflatable slide we rented for the day, you and the dozen or so kids who showed up during the course of the afternoon were free to run around like happy puppies from one amusement to another. (And since it was in the middle of the afternoon, no one had to worry about a meal; instead, we set out goldfish, fruit, and other snacks and drinks and everyone was happy to help themselves.) The only time the kids were temporarily harnessed was when you opened presents – which was the first time many of them had spotted and noticed the trampoline, so even that segment had its kiddo appeal.